My work through the Initiate Path of ADF has been slow but steady this past year. I may not always be “studying” in the traditional sense, and I may not be as prolific as others in ADF, but I’m always doing something. Writing prayers for my practice is one such something. On this Autumn Equinox, I share with you a prayer I started around the Summer Solstice, and tweaked throughout the season. I now say it while tending my garden, or harvesting food and herbs as I did today. I usually sing it to the tune of “Now the Rite is at an End.” It just fits! And give thanks for this great crop. And the cycle never stop. May your harvest be bountiful, and I hope you get outside to enjoy the seasonal changes. As for my family, we are joining with our grovemates to celebrate! Feel free to utilize the prayer in your own celebrations and gardening work. Or, even better, perhaps it will inspire you to write your own! When I woke up this morning, after going about my toilette, I approached my altar, but decided I would hold off on my usual devotional. I felt unsettled, so I went outside. I contemplated yoga, but my inner voice urged me to stretch up to the sun, to feel the dewy grass on my feet, then pour a libation instead. That felt good. I said a prayer of thanksgiving. I returned to contemplate my altar. I’ve been in my home for just over a year, now, and the corner altar in my kitchen has stood for about that long. I examined the buildup of incense dust and cobwebs. I work with my altar daily, but bits of rituals past cling in the shadows of rocks, offering bowls, and statuary. When spiders move in, I tend to welcome them. My mother always taught me that, unless they present a danger, they are good luck. I offer hospitality, but that means their webbing, shed skin, and bits of dust linger when they move on. My eyes took all of this in, and I began to consider how this time of year – September in particular – always finds me slightly detached from my practice. My work life reclaims much of my energy. I have little else to give when I return from a long day of teaching and nurturing children. I view what I do as an extension of my relationship with Brighid. My values, my beliefs, they do not go away. They inform me, guide me… and yet, my time and energy to do deeper spirit work diminishes. It is a frustrating part of my own personal wheel of the year. I am missing Pagan Pride Day today. Ever since I had a child, it’s been hit or miss for me. I’m exhausted. My family is exhausted. We’ve all been exposed to everyone else’s germs at school, and my daughter is not feeling her best. So I’m putting our health first, knowing that we will be with our grove to celebrate the Autumn Equinox next weekend. That will reinvigorate me further, and carry me into the Samhain season, renewed and ready for rebirth. Back to the dusty altar. The dust, I realize, represented something more. Yes, that sort of thing accumulates through life and ritual (especially when incense is involved). Yet there was more – it was the miasma of magic past made manifest. The spiders, drawn to the corner to catch fruit flies opportunistically sipping from my offering bowls, were telling me I needed to tidy up. So I did. This morning, I did not light any incense. I did not make any offerings of food or drink at my altar. I gave time and care. I dusted each item with love. I washed away residue. I replaced each sacred object tenderly, kissing some, stroking others. I made sure my allies knew they were still very much welcomed. You may wonder if I considered the moon phase or astrological sign. You may nod with approval as I did this before a High Day. You may shake your head at me for the informality of it all. However, what I did felt right, and listening to your heart, your instincts, then acting on them, using what is at hand, is an important part of my practice, I feel. Considering that I am putting a lot of thought into the Autumn Equinox ritual next weekend, this very off-the-cuff cleansing ritual felt like a needed juxtaposition. Tonight, I am planning to ritually sain and mark the anniversary of our moving here. I will honor the spirits in my home, and re-consecrate that space. In the meantime, I’m going to sit and pour an offering to myself: a well-deserved cup of tea. The actual Autumn Equinox felt more like Summer’s last gasp. The leaves were changing, but the heat was intense for September in Upstate NY. It makes me glad that my grove decided to celebrate a week later. Yesterday was perfect. The air was finally cool; the wind had a bite. The sun shined through flocks of happy clouds. It was the perfect day to stand around a bonfire surrounded by standing stones. Before ritual, my daughter had seen me working on offerings throughout the week. I embroidered a token and an ornament. I decorated a stone. She saw me go into a liquor store to get Brighid’s favorite. She decided she wanted to make offerings, too. Without any prompting, she started to draw pictures for Brighid and the Nature Spirits. It was so precious. She even wanted to roll them up and tie them with pretty yarn. It made my chest swell with pride to see her so interested in giving back to say thank you for all our blessings. My husband and I even saw her singing along to some of our chants during ritual. My friend Cassandra lead the rite. She did a remarkable job, as always. I’m so proud of her. She recently completed her Dedicant Path, and now I have a study buddy for the Initiate Program! Our ritual honored the Earth Mother and gave thanks for the harvest. Our magical working was to send healing wherever it was needed, and to keep that light with us so that we could remember ways to help. With everything happening in the world, I feel like I went to a dark place with my ritual parts. We called to various Indo-European Earth Mothers. I called to Gaia and Macha – both goddesses who were mistreated by others, be they other gods/Titans, or kings and other men. Gaia was in an abusive relationship. Macha was betrayed and forced to hurt herself while pregnant, resulting in a curse on all the men of Ulster. I spoke of outwitting oppressors, and escaping victim-hood. I spoke of the Earth as the ultimate mistress, who will always have the last laugh if we mistreat her. When I called to the Gods, I felt compelled to talk about how we strive to emulate their better qualities rather than their failings, much as children should do with their own parents. Clearly, the news is getting to me, but I always see ritual as an important time to reflect on the lore, how it relates to what is happening in the now, and how it all translates to our Druidism. I see the darkness, but I also see my daughter’s growing involvement. Like a little candle herself, she gives me strength and hope. Today is the Autumn Equinox. It was chilly when I went outside to perform my morning devotional. The leaves are changing. Apples are ready to harvest in Upstate NY. Be that as it may, our afternoons have felt particularly summery lately. It’s tempting to run off to the beach this weekend, but I think we’ll return to our favorite local cider mill instead. We’re mostly settled into our new home. There are still some boxes to sort through and rooms to organize, but at least we’re all moved in! As with all of life’s great changes, moving has disrupted my personal practice. I’m only starting to reestablish my routines, but it’s been difficult when my altar is still in a state of flux. That said, I have everything I need to engage with my spirit allies and give gratitude. That’s a huge part of what the Autumn Equinox means to me – giving thanks for what we’ve harvested all season. In the meantime, I’ve set up an evolving shrine in my backyard. The yard is one thing I’ve “harvested” that I’m particularly grateful for. It may not be acre upon acre of forest, but it’s safe for my daughter and relatively private. I have shaded areas thanks to some lovely trees, and I have sunny spaces for a garden. I plan to plant a small grove of trees in the back. There is a lot of untapped magical potential in the land. As much of nature prepares to sleep, I’m excited to see what will grow in the spring. I look forward to working with the land to create even more fertile spaces for my family and the nature spirits who already live here. I’m grateful to my little container garden. 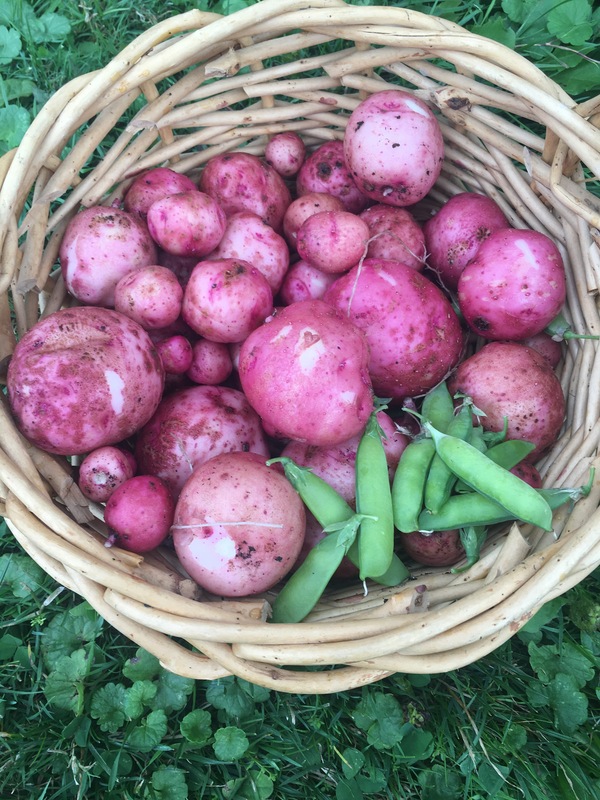 We had a good harvest of potatoes and snow peas this year. I also have a decent pot of sage, and even some dill. We grew more tomatoes last year; moving really distracted me from carefully tending the garden as usual. Still, I’m pleased with what we have and the lessons I learned. Finally, I’m grateful for the house itself! Last year, I didn’t think home ownership would be in the cards for another decade. My husband and I have worked so hard paying off debt, managing our money, and making ends meet. I may not have much of a literal harvest this year, but what did come into fruition is pretty darn spectacular! I hope my readers have a very blessed Equinox! 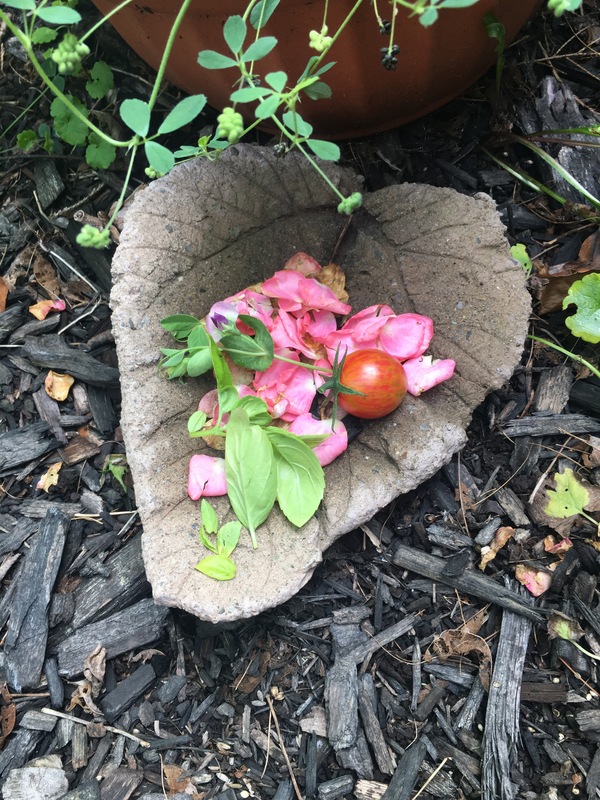 As Lughnasadh starts to turn us towards the Autumn Equinox, and as it is the beginning of the major harvests, I find myself reflecting on the successes and failures of our little container garden. Each year, we learn more about our plant allies. Each year, through a mixture of experience and research, we recognize opportunities for growth and improvement. 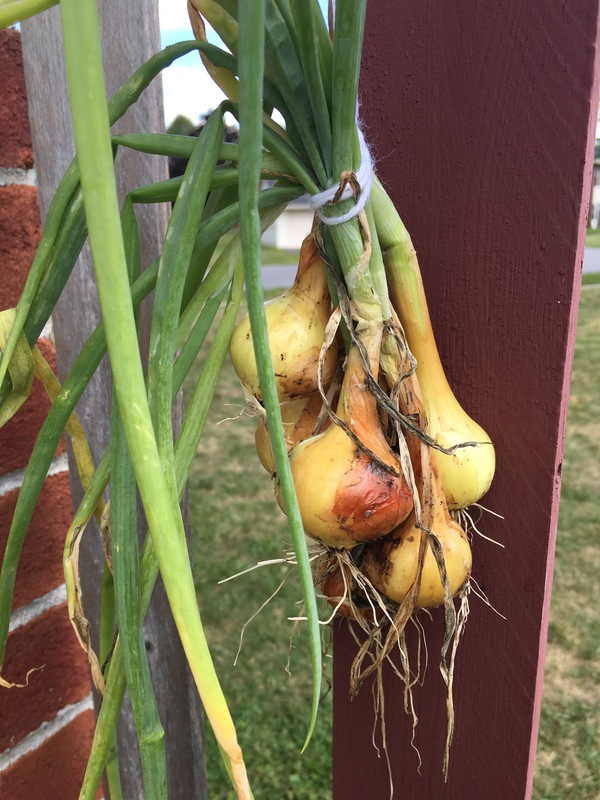 I also picked our onions and hung them to dry out a little. Photo by Grey Catsidhe, 2016. We gave offerings to the local spirits in gratitude for our bounty. Photo by Grey Catsidhe 2016. Not pictured is the basket of tomatoes we gathered, mostly from my husband’s hydroponic buckets. In addition, I also gathered some basil and sage which I hung to dry. I’m so grateful for the opportunity to contribute to our own cupboards. I’m also thinking on my metaphorical harvest. I’ve had a fairly productive and joyful summer. My family hasn’t faced as many struggles this season. I have had more opportunities to do things that make my soul sing. I have room to improve, but the harvest is stil good. As we move toward Autumn, I’m already preparing a fall garden. I’m also making new goals – things to sew, books to finish, essays to write… May my next harvest be just as, or more, successful! What Did You Harvest This Year? I spent Saturday celebrating early with my lovely protogrove. We sang, honored the Earth Mother, and feasted on our bounty. I was honored to lead a friend and grovie’s mother blessing as our magical working. It was wonderful, and definitely a post for another time. Today marked the actual Autumn Equinox, and I had a quiet observation with family in the form of dinner – a soup made with homegrown potatoes and locally grown beet greens, a shared bottle of hard cider, and a bit of time outside with my garden. Many of my plants have gone through their lifecycle, yielding small but enjoyable bounty. It’s easy to get discouraged by how little I grow in my containers, but I always learn something new, so it’s worth it. For example, this year I learned a better way to start tomato seeds indoors, had success growing lemon balm from seed, grew a bunch of snap peas (and have started another crop since they’re cold hardy), grew onions from starters, and even had a tiny success experimenting with okra. Along with a small pile of potatoes, a few tiny cucumbers, a little kale, some small eggplants, five large sunflowers, a surprise pumpkin, and a few pots of herbs, I think I did pretty well for a wee patio garden! I’m grateful for so much other bounty, though. My daughter is growing well. Maybe I can’t grow enough food to feed us all winter on my own, but I’m raising a smart and sassy little girl! I’ve continued to support my family in many ways, even though times are occasionally difficult. We pull through together! Intellectually, I learned how to knit socks, I’m improving my Spanish (yes, my Irish is on hold), growing in my profession, in my understanding of the local ecosystem, and in my understanding of Irish history and lore. I’m no Morgan Daimler, that’s for sure, but I apparently know enough to have respect in my protogrove*! Speaking of my protogrove, it’s been a year since Northern Rivers Protogrove experienced a bit of drama in numerous forms. We persevered and learned from it. Members who had to take a step back due to health reasons have returned, we’ve gained another new member, and yet another was raised to Folk status after an initiation ceremony. We are a small group, but we’ve managed to stay active, continually improve our ritual skills, and have become an even closer family. We’re moving towards full grove status! Cheer for us! Spiritually, and related to my role as a grove organizer, I’ve continued to (slowly) work through my various ADF study programs. I find myself growing in roles that help my community. Writing and leading rituals has done a lot for my liturgist skills. My divination skills have been improving too, and one of my protogrove members actually asked me to do a reading for her, which, again, honors me. I love giving back to my community, and it validates all the hard work I’ve been doing. While I may not have a cornucopia brimming with tons of homegrown fruits and veggies, I think I’ve done pretty well with this year’s harvest. What are you thankful for this year? I hope you take time to count your blessings as you celebrate. *I seriously admire Morgan Daimler. I would love to know a quarter of what she does! Read her books! I was up late preparing for my protogrove’s Autumn Equinox celebration, and I woke up earlier than usual on a Saturday to continue my preparations. I’m not even leading today’s ritual, although I am performing several important parts. I’m also leading the magical working: a grovemate’s mother blessing/saining ceremony. There’s a buzz of excitement in the house. Perhaps it’s just me, but I’m truly excited. That never has to go away. You may celebrate different holidays now, but you can approach them with that exuberance. It’s hard when you first step on a spiritual path that is different from your family’s, but I think that’s especially so when you’re embracing a minority religion and you are clueless on the community around you. During my days as a solitary eclectic practitioner, finding my way, I would honor the holidays by myself in my bedroom or, sometimes, in the forest. The initial buzz of taboo a converted Catholic might feel wore off, and I was left, instead, with a bit of sadness. Sometimes, it felt too much like an obligation. Of course, those of us who walk these paths embrace a self-imposed obligation to revive and maintain the old ways, but it shouldn’t be begrudgingly. We should leave behind the “12 Pains of Christmas” attitude when moving over to the Earth-Centered paths. Finding community changed everything for me. Suddenly I wasn’t alone. I found a spiritual family! Of course, I’m sure it’s perfectly possible for a solitary practitioner to celebrate the holidays with joy, but for me it didn’t work. I needed that community. As a child, I planned Halloween costumes with my parents. I watched that Thanksgiving parade with my sister. I counted down the days to Christmas with my family and friends. Each was followed by celebrating with others, and I crave that community. In my humble opinion, since Druidism is a tribal religion by nature, these very community-centric celebrations are experienced best with others, sharing in the joy. Now that I’m older and wiser, I realize that, even if my family isn’t Polytheistic or Pagan, we all connect in our appreciation of picking out pumpkins, drinking apple cider, making snowmen, planting in the spring, and that first dip in the river after a seemingly endless winter. You may not have ritual with your biological family, but you can still celebrate together. Whether you are part of a grove or not, find your joy and excitement. Really meditate on what you’re doing and why. Create an appropriate playlist and fill your home with mirthful sound. Plan a special, seasonal meal and decorate with plants and harvest to connect with the land. Plan important magical workings for the day and truly anticipate it. Embrace the day as a child would. If you’re like me and you have a child, think about what he or she will remember down the road. What pleasant nostalgia will fill her heart when she sees the seasons change?